And it flows. From nowhere, a strong physical wind sweeps through the damp, still tent, the summer heat, brushing our sides and our faces. People begin to murmur. Around me, children speak in tongues. Rachel’s standing beside me too, beautiful and older and slim, and she begins murmuring, then laughing more and more, until she’s filled with the Gift of Laughter, and can’t stop for all her thirteen years. Under the startled encouragement and direction of our elders, we turn to one another, adults to children and child to child, and pray for each other, for tongues, for healing, for prophesy. The wind moves a little more, and those with tongues pray over me too, and I ask God intensely, me too, me too. But it isn’t me too. Inside, there’s only yearning and stillness, an open heart that reaches into the firefly darkness and hears no reply. 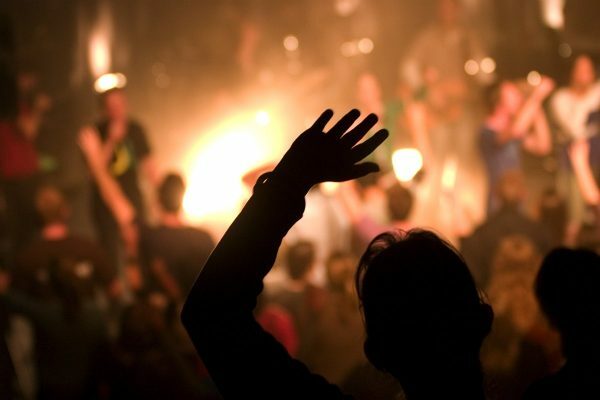 And through long years of revival and prayer nights, youth retreats and intercessory prayer sessions, worship events and small groups, I bubble with no tongues, no eloquent prayers or moving prophecies. I can’t seem to catch a vision, though my imagination is lively in other ways. I stand and watch, and seem to develop the gift of observation instead. I’ve just been reading Tanya Luhrmann’s When God Talks Back, and it’s bowled me over. I first met Tanya a year ago, when she was presenting early results from her research. 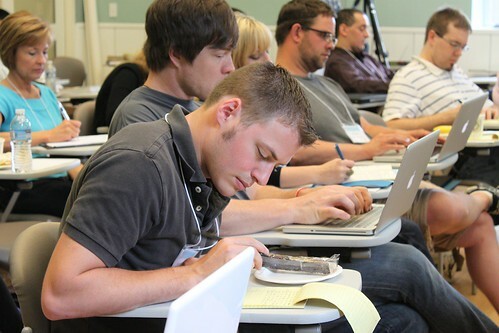 A slim, perceptive anthropologist, Dr. Luhrmann stood on the sidelines of the Society of Vineyard Scholars conference with fellow anthropologist Jon Bialecki, taking notes. Both anthropologists study my home church community, the Vineyard – a loose-knit association of middle-class charismatic churches in North America. “Do you really do this?” Luhrmann asked. “All the time!” her respondent says. As someone curious about the human psyche, Luhrmann was hooked. What makes people think they can have coffee with God? 2003. We’re standing on bleachers in some Cincinnati stadium, a giant hollow sports center booming with sound and bodies. Beside me Stacy’s jumping up and down in ecstasy, and Steph lifts her hands to the sides of her upturned face. I’m sandwiched in the middle of a row of bible-study girls from college, pressed in on all sides. Our tabbed bibles and bent journals are carefully tucked on the seats behind us, filled with church-group notes, self-improvement prayers, and to-do lists for our class projects. We may not be the class queens. And for a brief moment I feel it, ten minutes of euphoria, a flitter of joy like a poem produces on a quiet afternoon. I try to mirror their ecstasy, rising… but quickly fade, and watch the joy bubble around me and past me, as on every Sunday morning. Finding these intense relationships with an invisible God intriguing, Luhrmann joined a Vineyard church in Chicago, then spend several more years at a California Vineyard, attending services and retreats and small groups, and asking questions. She looked for places where God was “real” to people and intimately involved in their everyday lives. As a psychological anthropologist, Luhrmann tried to figure out how people develop the capacities of imagination that enable them to connect to God in intimate ways. I started writing the personal sections of this essay months ago and dropped it. But as I read Luhrmann’s book, I came back to my memories of spirit-filled Christianity, seeing them again through anthropological eyes. 2007. It’s a muggy Saturday afternoon, and I’m in church, waiting for the mandatory class on healing that stands between me and my Vineyard church membership. This was my parent’s church, but I’m an adult and they’ve moved away, so I figure it’s time for me to be my own member. Around me, short mothers in t-shirts, paunchy fathers in jeans, young women in slim jackets – all are all arrayed with pencils and notepads to learn how to pray for others. Overhead fluorescents and side sconces keep the room evenly lit, each chair the same soft grey, and hooked to the next one. This is a “chapel,” but it has a conference hall ambiance. At the membership seminar last week, we were each handed a folder with a timeline of Vineyard history, a statement of faith adapted from the Nicene Creed, and a “passport” to church membership. “Attend membership classes,” it says, “get baptised, join a study group, volunteer with the poor, promise to tithe and help out with the children, attend sessions on prayer and healing. Then you can join us.” Each step to membership requires a stamp or signature from a church leader. Each is meant to get us fully engaged and syncing with others in the church. But our attention is up front now, as Mike and Sue describing how God speaks to us and uses us to encourage or challenge others. “This is about practice,” Sue says, and asks if we want to hear a word from God. Please stand up, she says, to Hear from God. Every person in the room shuffles and stands up, probably fifty or sixty people. But I remain seated. Why should I stand? I tell myself. God seems to speak mostly through printed poetry and academic articles, so why pretend an interest I don’t feel? Men and women bow their heads, eyes-closed, open their hands. Some shake, some murmur. I feel a little virtuous, sitting in my seat, being my honest self. People follow Sue’s instructions on how to listen quietly for God. He gives words to our minds, sometimes pictures or little snippets of a holy action movie, she says. Quiet yourself, just listen and watching, speak it and we’ll evaluate what you’ve heard. The crowd listens, and practices. A young girl is called forward and told she will have a baby; a man’s family is prayed for; a mother is being called into leadership. 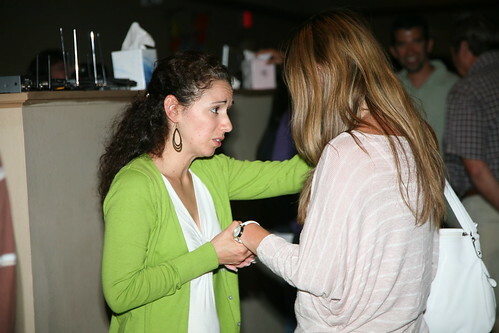 People “lay hands on” each other, touching each other’s shoulders as they listen and pray. But as people cry, and shake, and laugh, and we pray again… I start crying. Bawling really, for no reason I can understand. I slip out into the hall, sobbing, then rejoin them at the end, still snuffling. Everyone else seems calm and collected… what’s wrong with me? The next week I process it at my local bible study. “I wasn’t interested, but then I realized that healing isn’t for me,” I confess to the group, us collectively engaged in sensemaking. “Hearing God is about being willing to help others. And I do want to. I do.” Everyone nods and smiles and prays. Even if the experience itself was sudden and jarring, the warmth of a Vineyard group of friends seems to make it all okay. Luhrmann talked with tons of these people, both those who are successful in the Vineyard and those who don’t fit in. She considered whether how people engage in spiritual practices could shape their “relationship” with God. Relating to God as neither real nor unreal, but hyperreal, she suggests, people in the Vineyard engage in serious make-believe, imagining relationship activities with God, in order to feel like he’s more a part of their lives. But what makes this work? She wondered. So Luhrmann went a step beyond anthropological observations – I love this! – and started interviewing people about spiritual experiences that were out of the ordinary, or intense visions. And then she started doing psychological experiments. 2011. I’m in a small church with pointed wooden roof, and the pews are filled with scattered academics, notepads in hand, plastic name-labels on their chests. Yale. Bethel. Central Vineyard. Seattle Vineyard. We’ve finished a worship session and everyone looks relaxed, greets their neighbor, builds their network, pastor-to-pastor and grad-student to grad-student. A few of the older men quickly check their email by iPhone. Someone tweets. Outside it rains heavily on the pines. It’s the second annual conference for the Society of Vineyard Scholars, and Tanya Luhrmann – yes, this same Tanya Luhrmann – gets up to speak. She might be curious about us, but we find her curious as well. Both she and Jon are secular academics, from prestigious west-coast universities, but they’ve come to study and report on us. Us, pudgy, earnest middle Americans! Tanya outlines her ideas on how social learning affects our sensory experience of God, as above and in her book. She describes her major mind-experiment, in which she handed out iPods to volunteers loaded with either 1. imaginative visualization of bible stories (“kataphatic prayer”), 2. mind-emptying meditation guides (“apophatic prayer”), or 3) study tapes outlining academic thoughts on the bible. Three ways of praying to God, and the last – academic thoughts – is probably my favorite. But when she had the volunteers listen daily, she discovered that both those who meditated and those who visualized experienced God more vividly over time. (Those who listened to lectures, darnit, didn’t experience any change). These praying people reported more visions, impressions, psychic experiences. It seemed that regular practice was affecting their consciousness and their experience of God. Luhrmann outlines this wryly with a simple powerpoint, carefully avoiding statements about whether God is real. Instead, she says only that she can tell what people are experiencing mentally – and how they’re trained for these experiences socially – in situations where they understand themselves as experiencing God. As someone who believes one day and doubts the next, I’m not sure how to take this. But the assembled Christian academics don’t have any hesitations. 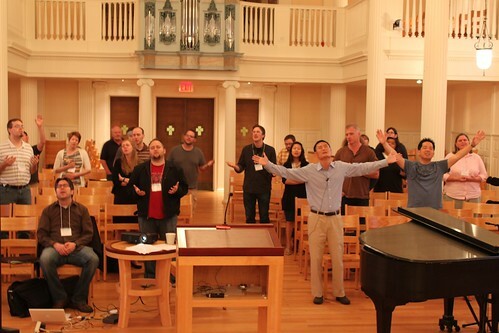 After extended academic discussion, the conference attendees move into prayer and worship. Having grown up in these religious environments, gone to grad school in anthropology, and attended Dr. Luhrmann’s lecture, I’m impressed by her book. The writing is careful, balanced, and witty. She walks the fine line of studying first-world religious people, people who can and do “talk back” to the anthropologist, without losing her focus. She gives credit to her grad assistants, which I always appreciate (!). And her empathy, precision, and methodology are outstanding. Yes, it’s long with a big chunk of footnotes, but if you’re interested in the topic, well worth it. Ultimately, Luhrmann neither condemns nor elevates religion. She simply presents it as a picture of American social and psychological life. And in so presenting, she illuminates a part of the vast and absorbing social and spiritual world that so many of us inhabit. 5/5.